KOCHI: The seventh annual conference of the Indian Society for Neuro-oncology (ISNO) held here has come up with guidelines for treatment of the commonest brain tumour – medulloblastoma – in children. ISNO general secretary Rakesh Jalali, who is also professor of radiation oncology at Tata Memorial Hospital, Mumbai, said there was a lot of heterogeneity or diversity in treatment of diseases in India. The treatment protocols are changing rapidly the world over. Indian patients may not necessarily like western patients as they have different demographic profiles, different genetic characteristics and the resources are also different. It is very important, therefore, not to adopt western guidelines, which can be disastrous and may not be effective at ground level. Jalali said that the treatment of brain tumour required the involvement of a healthcare team, including surgeon, radiation oncologist, rehabilitation expert, psychologist, pathologist and basic scientist. Therefore, it is essential to have a guideline for the treatment.In India, every year 40,000-50,000 persons are diagnosed with brain tumour, of which 20 per cent is children. Amongst the children, around 25-30 per cent, or 2,000-2,500, are medulloblastoma patients. If detected in time, 30-90 per cent of the medulloblastoma cases are curable, provided the treatment protocol is followed correctly. “Cure means, they can live upto the age of 70-80,” said Jalali. The guidelines have been collated by identifying those which are the most applicable in the Indian conditions. The guidelines will be disseminated to the neuro-surgeons, oncologists and pathologists, so that they are widely accepted. The three-tier guidelines include, ‘what is absolutely essential’, ‘favourable’ and ‘those only for tertiary sector’. 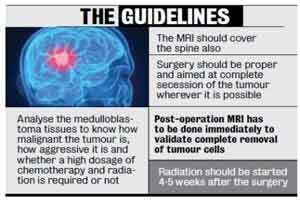 The guidelines are: the MRI should cover the spine also; surgery should be proper and aimed at complete secession of the tumour wherever it is possible; post-operation MRI has to be done immediately to validate complete removal of tumour cells; analyse the medulloblastoma tissues to know how malignant the tumour is, how aggressive it is and whether a high dosage of chemotherapy and radiation is required or not; radiation should be started 4-5 weeks of the surgery. The three-day national conference was attended by about 250 neuro-surgeons, oncologists and specialists from the related fields from across India, the United States, Canada, France, Australia, Philippines and Nigeria. It was hosted by the Amrita Institute of Medical Sciences and Research Centre. On the occasion, two neuro-surgeons were given awards for their exceptional contribution to the field – Dr Aliasgar Moiyadi of the Tata Memorial Hospital for ‘clinical practices’ and Dr D N Nandakumar of the NIMHANS, Bengaluru, for ‘best basic science work in neuro-oncology’. Besides, three medical students were given the ISNO President’s Awards for Students.